Note: this is a license update. No physical product will ship. Milan Digital Audio will then send you an updated license file for your dongle. To apply it to your dongle, go to "Apply a license update file" and click on it. 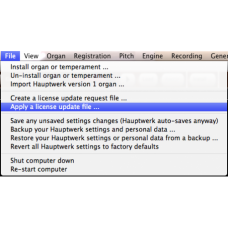 Select the "HauptwerkDongleUpdate.LicUpd.Hauptwerk.rar" file that was sent to you by Milan Digital Audio. 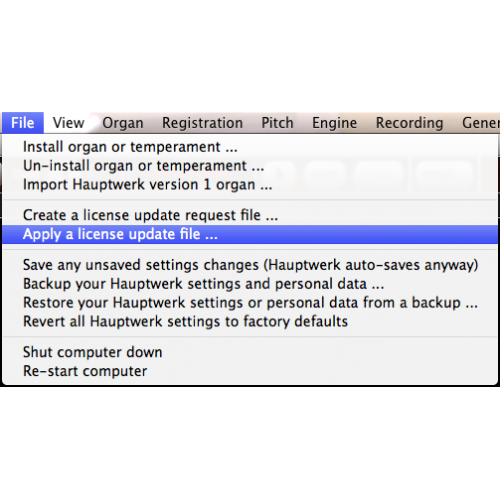 When the update has been applied to your dongle, Hauptwerk will ask you to close Hauptwerk and restart it. Once that is done, enjoy Hauptwerk 4.